Skybolt is an innovative company. We invest vast time and money in design, engineering, and creation of innovative fasteners for a wide spectrum of industries. Skybolt is currently filing patent paperwork at an average rate of 1 every 60 days and could file more based on our unique engineering experience in the world of Panel Fasteners. 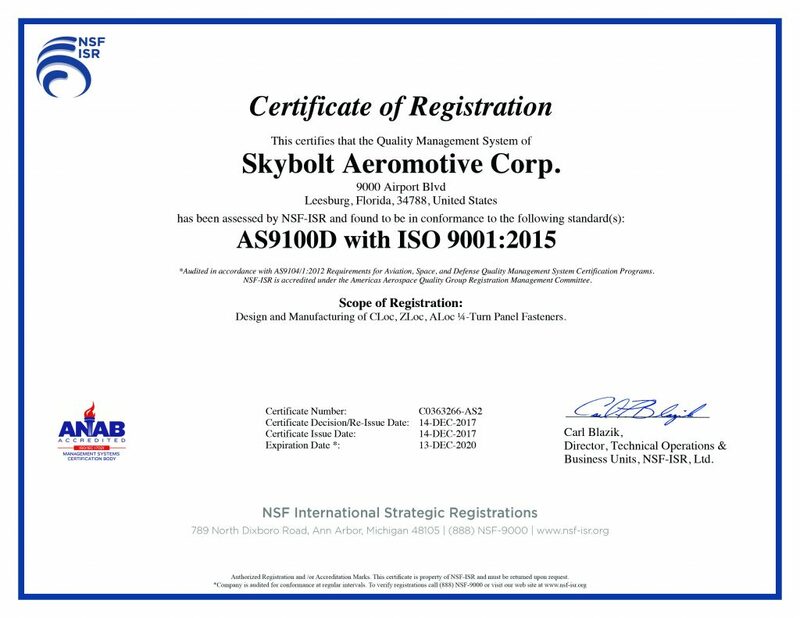 Skybolt keeps a constant revision approval system with our aerospace oversight department of the US Government to maintain current TSO approvals; a rate far higher than most ISO9000 or AS9100 requirements. AS9100 and FAR21.137 QMS (Quality Manual System and Quality Standards) certified and inspected by the Federal Aviation Administration, Manufacturing Inspection District Office (MIDO) and Airframe Certification Office (ACO). FAA PMA PQ1554CE and Production Holder (PAH) certified and inspected by Federal Aviation Administration Manufacturing Inspection District Office (MIDO). Supplemental Type Certificates approved and inspected by the Federal Aviation Administration, Manufacturing Inspection District Office (MIDO) and Airframe Certification Office (ACO). Calibration Standards as per MIL-45662A/ANSI/NCSL Z540.3-2006/ISO 10012-1 & ISO/IEC Guide 25; and AS9100-7.6, 8.2.4 and FAR21.137(f). Statistical Sampling as per ANSI/ASQC Z1.4-1993. Cloc® components are manufactured to meet and exceed NASM5591 Table II Performance (unless noted) with in-house testing/independent testing. CLoc®, ALoc®, ZLoc® components (unless noted) are approved under TSO-C148 requirements for installation or replacement on all TC certificated airframes.